Can we be forgiven without saying sorry? There is something missing in the gospels! I am shocked! So often we read the Bible so closely to see what IS there, it’s not often that I am so forcefully struck by something that is NOT there. Yesterday I took a primary school assembly on ‘how to pray’. Using a teaspoon, I taught the children that prayer can be very simple. If they don’t know what to say they can remember the abbreviation for teaspoon and it will help remind them of the three most essential things to say when we pray. I’ve done this assembly before but not had time for stories. Yesterday I had time to illustrate my points so I was racking around in my head to think of examples for each prayer from the gospels. P was easy. People were constantly saying ‘please’ to Jesus: ‘please would you heal, please would you come, please would feed us, please do this, please don’t do the other, and on and on and on’. Jesus was overwhelming petitioned and what’s amazing is that most of the time he said ‘yes’ and he sometimes even took time to heal people who hadn’t actually asked. No wonder he often withdrew to solitary places to pray! Phew, I was overwhelmed by all the possible ‘please’ examples I could have used. T wasn’t as easy to find. There are actually very few recorded instances of people saying ‘thank you’. Eventually I settled on telling the story of the 10 lepers although the actual point of that story is that 9 completely failed to say ‘thank you’ (Luke 17:11) Some days a simple thank you is just the kind of positive feedback that puts me back on my feet. If the number of thank you stories are representative of the kind of positive feedback Jesus received then I suspect he had to manage on very little. But ‘S’? ‘Sorry’? (This is where I had my shocking revelation) No one ever, ever, ever says sorry to Jesus! And, let’s face it it’s, there was plenty of scope for apologies from the disciples alone. Because in spite of all the stupidity, ingratitude, misunderstanding and sheer cowardice, Jesus goes ahead and surrenders himself up to a grossly unfair justice system, to the baying of a whipped up crowd and the cruelty of an agonising death. 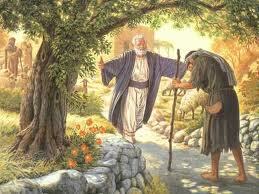 I am amazed that in the gospels there is no example of repentance for me to follow. In fact in order for there to be one, Jesus had to make up, not one but two stories. The first is about a boy who came to his senses, admitted his foolishness and returned to his father. But even in that story the emphasis is hardly on the apology which is barely out of the boy’s mouth before the Father overwhelms him with love and welcome. The second story is about two men who go to the temple and pray: one thanks God that’ he’s not a sinner and the other beats his chest in humility and acknowledges his guilt (Luke 18:13). Guess which prayer works? Peter, whose three-fold denial left possibly the most glaring need for an apology ever, had to have his admission of failure coaxed out of him sideways by a gently rebuking Jesus. Even Peter didn’t manage an apology; he just managed to look sheepish, which, let’s face it, is our fairly standard human response. But it was enough, what a relief that is for all of us for whom ‘sorry seems to be the hardest word’. Ironic then, isn’t it, that it is actually Judas who comes the closest to an ‘apology’ at least in terms for totally taking responsibility for his own actions ‘I have sinned… I have betrayed innocent blood’ (Matthew 27:3) he declares to the indifferent Jewish authorities. You can’t get much clearer than that? So sad then that his subsequent action suggested that he despaired of the possibility of grace. There IS one other very beautiful act of repentance in the gospels: it is wordless and it is performed by a woman. We know she is repenting because Jesus accepts her actions as a form of penitence and gives her an absolution for her sins (Luke 7: 47 and 50). Maybe that is why in Mark’s version of this story, Jesus comments that this woman’s act will be remembered wherever the gospel is preached (Mark 14:9). I know there are plenty of references to repentance outside of the gospels that point to repentance being important (1 John 1:8,9 for example) so clearly repentance has a right and necessary place but sometimes we elevate it to the status of a ‘work’ in other words it earns us salvation. The reality is that salvation was won for us, it is bestowed on us. It is, from first to last, the work of God and the gift of God. Maybe this short reflection on the missing element of apology in the gospels should cause us to think about the immeasurable depths of God’s love. ‘While we were sinners, Christ died for us’ ie before we apologised, repented, admitted our guilt, Jesus carried out the work of salvation well before anyone thought to either thank him or apologise for their part in putting him on the cross. The reason I find this gospel perspective so intriguing is because my evangelical heritage has ingrained into me the ‘four steps to salvation’ plan where God’s grace hinges completely on our act of repentance. This absence of repentance in the gospels goes somewhat against that emphasis. Sure, I know it says in 1 John 1:8, 9 that ‘if we confess our sins he is faithful and just and will forgive us from all unrighteousness’ but I can’t help feeling that over the years some Christians have put that IF in capital letters. And the effect of this is that our role in the story of salvation becomes too big, we become too self-important. (It doesn’t take much for an over emphasis on ‘being good at repenting’ tips us over into ‘being good at being good’ and suddenly we have arrived at justification by works ie it’s all about us). Great theologians such as Eugene Peterson and Karl Barth, to name two I have read recently, would say no, it’s all about God. Salvation is all the work of God and when we give ourselves too grand a part to play in the story, the risk is that we have a lessened view of the amazing, incredible, generous and all encompassing grace of God. Never forget that the prodigal never got to end of his apology speech, it was enough that he turned and headed for home, from that moment on his forgiveness was assured. It hinged far more on the character of the one who bestowed it than on the merit of his repentance. ‘I, even I, am he blots out your transgressions , for my sake, and remembers your sins no more’ Isaiah 43:25 Notice the reiteration of ‘I’ in other words, it’s all about me not you. Verses 26 and 27 go on to say (my paraphrase) ‘let’s look at your situation, it’s all gone horribly wrong from the very start, you don’t have a leg to stand on’. Now turn forward to Isaiah 44:22 ‘I have swept away your offences like a cloud, your sins like the morning mist. Return to me, for I have redeemed you’ Again, the double emphasis on the pronoun ‘I’. And do you notice the order? God says I have done this before you even asked or appealed for forgiveness, now all you need to do is accept the gift I’ve brought about for you. So to come back to the provocative question in the title: can we be forgiven without saying sorry? I think a change of direction towards God rather than moving away from him is necessary along with at least some sense of our inadequacy but we must not get too prescriptive about how that our needy disposition is expressed, my experience is that God will graciously accept the weakest of whispered prayers. Maybe the gift analogy helps here: forgiveness is a gift, already wrapped and labelled with your name on it, everything necessary has been already done. All you need to do is come with empty hands to receive it. ‘Call the Midwife’ and allow her to pray! Not a flippant question, Sheila: is it the same in a relationship with another human individual? I know I CAN forgive someone without their saying sorry, and – theoretically – they can for me, also. But God knows the innermost thoughts of our hearts; Jesus knew Peter through-&-through – our intentions are an open book to our divine forgiver. I realise that this isn’t the main point you are making (and that main point is really important). But maybe my human forgiver (Matt 18:21 ff in reverse) deserves a token of my sincerity? Hi Simon, it’s a great question. I’m not really sure. I guess you mean ‘if I forgive someone are they just forgiven by me or also by God?’ I can’t help feeling that Matt 16:19 and 18:18, might have something to do with this question but it’s one of those sayings of Jesus that sounds simple but leaves you thinking ‘what does that mean?’. He says it in the context of relational conflict in the second example. If it means what it looks like it means, then yes, if I forgive someone he/she is forgiven (the Catholic church would says this is a priestly gift handed down from Peter). In practise, I think forgiving someone frees us more than it frees them and as Phil helpfully says below, the relationship is only partially fixed. Sometimes this is all you can hope for, I love it that Paul says so realistically ‘as far as you are able, live in peace with all’. Ref Simon’s comment, when someone has wronged me I have to forgive them for my own good, otherwise I would allow a root of bitterness and judgement to grow in me. Surely God cannot have any bitterness in his character so he must forgive us even if we don’t ask for it. But then the relationship is not fixed unless we accept his forgiveness, but it is ‘not fixed’ on our side rather than his. Could it be that actions speak louder than words. God knows all our failings and we say many things that we don’t really mean, and make promises we don’t fulfil. It was the Son who got up and did what his father asked who is shown to be doing the right thing. So if we mean it we will do it! That’s great, I hadn’t considered the relevance of that parable, thanks. Great, thought provoking post, thank you. I am surprised that you can say “I am amazed that in the gospels there is no example of repentance for me to follow” when Zachaeus certainly repented of his wrong doing and offered to make recompense. You say” I know there are plenty of references to repentance outside of the gospels that point to repentance being important But what about the many references to the importance of repentance made by Jesus in the Gospels “The time has come,” he said. “The kingdom of God has come near. Repent and believe the good news!” (Mark 1:15) or “I tell you, no! But unless you repent, you too will all perish. (Luke13:3) to give but two out of many examples in the Gospels? I agree that there are no examples of people using the word “sorry” but as far as our salvation is concerned Jesus makes it pretty clear that we have to acknowledge that we are wrong and have to believe in him and accept him to be forgiven. Now I fully accept that “Whilst we were still sinners Christ died for us” but your blog seems to say that there is nothing required from us to effect God’s Salvation in us. Although Jesus says “So watch yourselves. “If your brother or sister sins against you, rebuke them; and if they repent, forgive them” (Luke 17:3) I do agree with other comments that if I am wronged I need to forgive even though there is no expression of regret or repentance otherwise the hurt will fester within me, but then I am not God, however our salvation requires more than just saying sorry to God.